Ignacio Nacho Piatti (born 4 February 1985) is an Argentine professional footballer who currently plays as a midfielder for the Montreal Impact in Major League Soccer. He has played for top division clubs in South America, Europe and North America. Piatti has played professional football in Europe with Saint-Étienne and Lecce. In his native Argentina, he has played for Chacarita Juniors, Gimnasia LP, and Independiente. On 17 August 2012 Piatti signed for the Argentine club San Lorenzo de Almagro for a reported fee of €1 million. He debuted against Colon de Santa Fe in the sixth match of Torneo Inicial 2012, Ignacio was the player of the match. 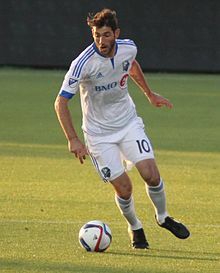 On 2 July 2014, Piatti signed a transfer agreement with the Montreal Impact of Major League Soccer. However, he remained with San Lorenzo until the team completed their Copa Libertadores campaign. He reported to Montreal on 13 August 2014, and debuted for Montreal against the Chicago Fire on 16 August  When Piatti joined the Impact, it was an instantaneous success scoring 4 goals in 6 games. He started all six games in the CONCACAF Champions League Championship Stage and helped the team reach the final against Mexican giant Club América, recording three goals and two assists in 526 minutes played. He is the all-time top goalscorer of the Montreal Impact and second all-time assist leader. Piatti is a technically skilled dribbler, who is capable of both creating and scoring goals, and is able to play in several midfield roles. Although he is capable of playing in the centre, behind another striker, he usually plays on the left wing, which is his favorite position, as it enables him to cut into the centre and shoot on goal with his stronger right foot; regarding his preference for this position, he has stated, "I played on the left for a long time, in Argentina, for example...I’d rather play on the left. I’m comfortable there." Although he is usually deployed in midfield, Piatti has also been fielded in several more offensive roles, and has been used as a second striker, as a false-9, or even as an out-and-out striker on occasion. Pedro, the grandfather and first coach of Piatti, died in March 2015. Piatti paid tribute to him by lifting his jersey to reveal the message ‘Abuelo te amo’, which translates to 'Grandfather, I love you', on a couple of occasions, most notably at Estadio Azteca after he scored the opener in the first leg of the CONCACAF Champions League Finals. ^ John Molinaro (26 August 2017). "TFC's Vazquez vs. Impact's Piatti a battle of MLS's finest". www.sportsnet.ca. Retrieved 2 November 2017. ^ Olivier Tremblay (6 November 2015). "After enduring a tough year off the field, Montreal Impact's Ignacio Piatti looks to close 2015 on high". MLSSoccer.com. Retrieved 2 November 2017. ^ "Impact signs Argentina's Piatti as designated player". The Montreal Gazette. 2 July 2014. Retrieved 10 August 2018. ^ Bill Beacon (17 March 2018). "Toronto FC shaded by Montreal Impact, despite possession edge". The Toronto Star. Retrieved 10 August 2018. ^ Anthony Lopopolo (21 September 2017). "Watch: Bono's clearance backfires as TFC gives up ugly goal". The Score. Retrieved 10 August 2018. ^ Lloyd Barker (25 August 2015). "Lloyd Barker: Tepid dawn to Drogba Era for Impact". The Montreal Gazette. Retrieved 10 August 2018. ^ John Molinaro (17 March 2018). "MLS takeaways: Piatti excels for Impact in win over TFC". www.sportsnet.ca. Retrieved 10 August 2018. ^ "Vancouver turns the tide and defeats Montreal". Canada Soccer. Retrieved 10 August 2018. ^ Sean Gordon (29 April 2015). "Impact's CONCACAF Champions League trophy chances dashed after home defeat". The Globe and Mail. Retrieved 31 August 2016.